Amla chutney is a nutritious, healthy, simple and a quick recipe. It is best to have this chutney in winters as Gooseberry is available in plenty in India and it provides immunity to our body, being rich source of vitamin C. Spread this chutney on bread slice or roti and Enjoy!! 2. In a mixer jar, grind amla to make a paste. 3. Heat a kadai/non stick pan, add amla paste along with all the ingredients. 4. Cook the paste on medium flame and keep on moving the chutney to avoid sticking at the base or sides of the pan. 5. After 10-15 min, chutney will be ready. 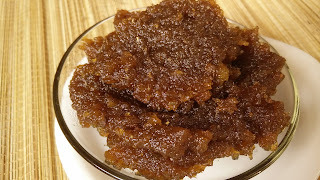 Note - Instead of jaggery sugar can also be added.